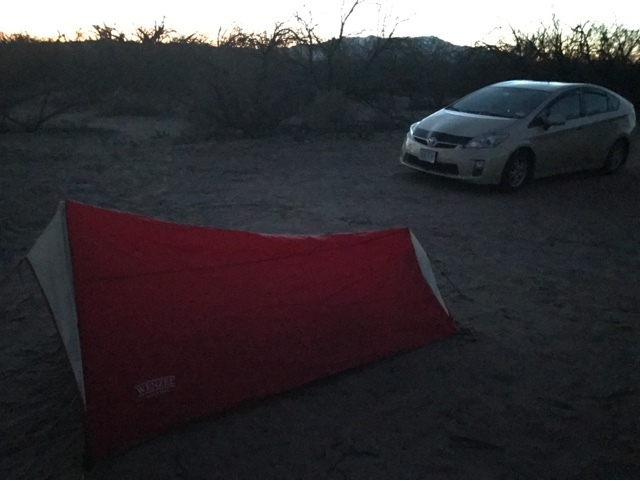 Those that follow my blog know I don't wish to sleep in a tent, when I have my bed in the Prius. I used to carry a 2P (2 Person) tent in my Prius but never used it, so I switched this year to this 1P from Walmart leaving me more space. On day 37 I reviewed this tent and it is my current choice for my backpacking tent in March at 3 lbs. 5 oz. The tent fits my new lightweight sleeping bag, lightweight mattress, and there is still room for keeping my backpack inside with me if I don't hang it from a tree. The tent is fine for my trip, as to save a pound, a new lightweight tent would cost $300.00 and that isn't worth it. I have now slept in my new lightweight sleeping bag for one night. The temperature got down to 34 deg, and it was warm enough for me with long sleeve tee and pants/socks and fleece cap sleeping in the bag. Obviously if it was warmer less clothing and colder I would need a liner inside the bag. The sleeping bag is lightweight and relatively warm. It is a comfort level of 30 deg with a lower level of 19 deg. Don't go by the lower number. My bag is good for 30 deg. This should be fine for the backcountry trip. It is not a winter bag. For other features to save weight the bag is narrow and not much room in the lower leg area, but it is worth the trade off for weight. Being a mummy bag, as the night turned colder, I closed the mummy hole eventually the size of my nose to keep the heat in. 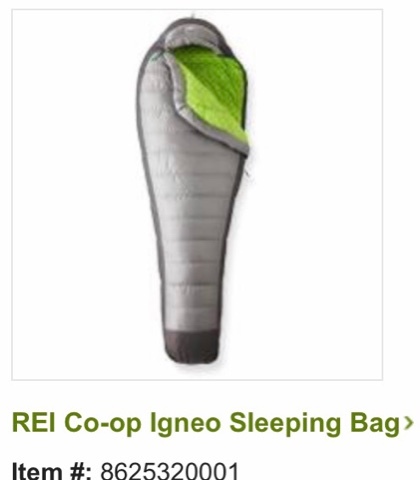 The sleeping bag was so light and as advertised I could blow it up in short order. It also has a great insulation rating so the cold ground never bothered me. To get the weight of the pad down it is the size of the mommy bag. 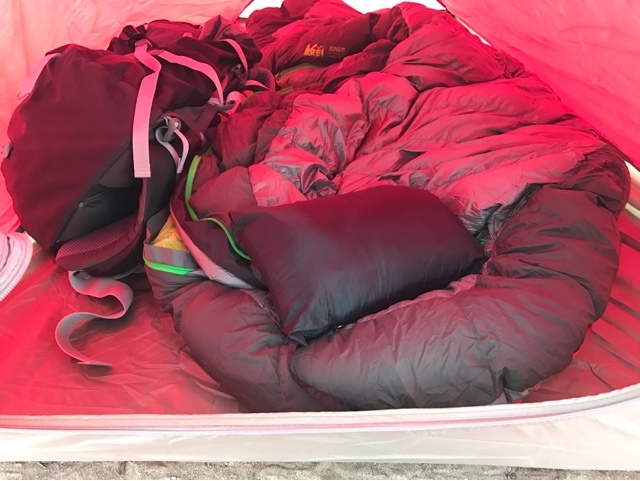 Overnight I noticed my leg area of my sleeping bag were off it at the bottom of the pad. It is also slippery and slides on the tent floor. I will using the sleeping pad but would like a way to keep the bag on the pad for the night. 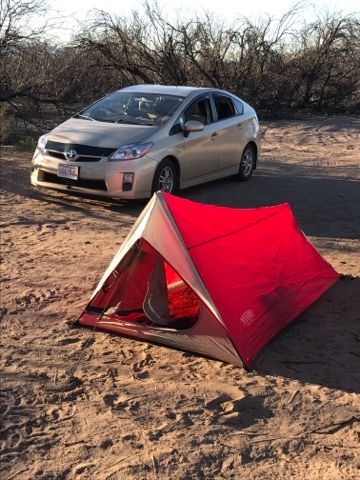 I'm trying it a second night but to tell the truth I like sleeping in my Prius. When morning comes I start the Prius and the heater is set for 72 deg. When I wake at 5 or 6 am it's cold in the tent and I try to wait for sunrise. I would like to have it a bit warmer for the overnight temperatures but it's 2 nights in the backcountry and I will settle for no rain. To entertain myself in the tent I listen to podcasts I download and often fall asleep to some part of them. There is no cell service where I currently am without using my cell phone amplifier. I will need to download many podcasts for my backcountry trip before I head out, as there is no cell service there either. Yes. Almost tine to head in for the night. 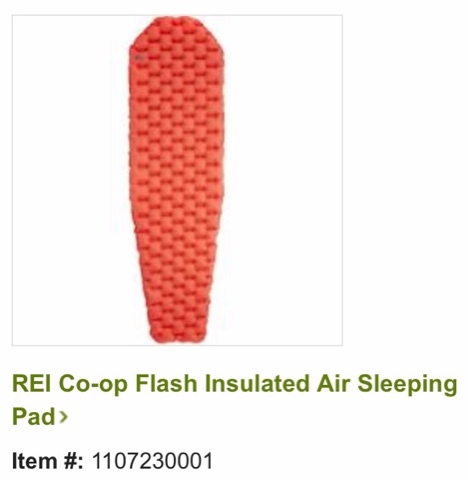 Could you sew a few pieces of velcro on your sleeping bag and then use the sticky backed velcro connector on the air mattress so it doesn't slip around? I doubt it would take much to keep the two together. the best suggestion I have Horton so far is a piece of rubber anti slip draw liner, but I'll live with slipping as I don't want to add another thing to my pack. If tent camping near the car then this would work well.